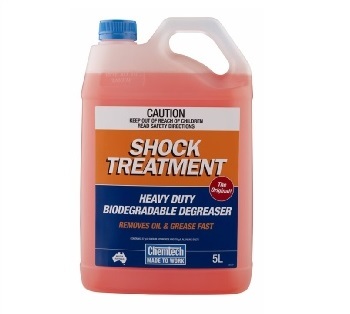 RL Shock Treatment is a specially formulated heavy duty biodegradable degreaser. This water based, non-flammable degreaser is suitable for all types of engines, equipment parts and driveways. Safe to use on plastic, rubber, glass and most metals and alloys. – Heavy duty biodegradable degreaser. – Cleans and degreases all types of engines and equipment and will also clean driveways. – Water based (non solvent) and nonflammable. – Converts oil and grease into a water soluble product. – Will not promote rust. – Can be applied by brush, sprayer, engine degreasing gun, sponge, foamer or high pressure washer. – Safe for use on plastic, rubber, glass and most metals and alloys.